OceanObs’19 will strive to improve the governance of a global ocean observing system, including advocacy, funding, and alignment with best practices and to designate responsibility for product definition, including production and timely delivery at the appropriate scales (global, basin, regional, national) to serve user needs. The conference program will be built focusing on a single objective each day to provide adequate time to answer to the proposed questions. 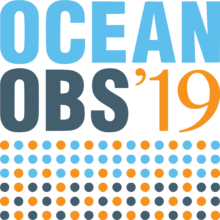 Registration to OceanObs’19 is now open on the conference website.